All the great posts I had planned for this week didn’t happen, so I’m posting my Friday mindless post. As a branding professional, I’m often asked to help name new churches or help churches change their names. So here’s a collection of unusual church names I would not be so flippant with God’s name But What Are You? If you’re tired of the exciting church, this is your option. If your blood pressure can’t handle this much excitement, then visit the Boring UMC Everything worth doing is worth doing, well, half way. I guess that includes churches. 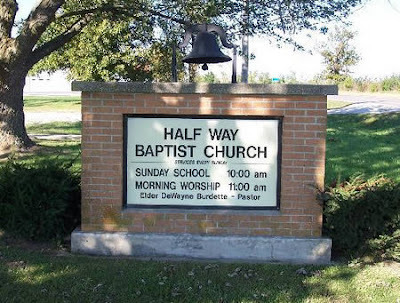 What’s the most unusual church name you’ve visited or driven by?